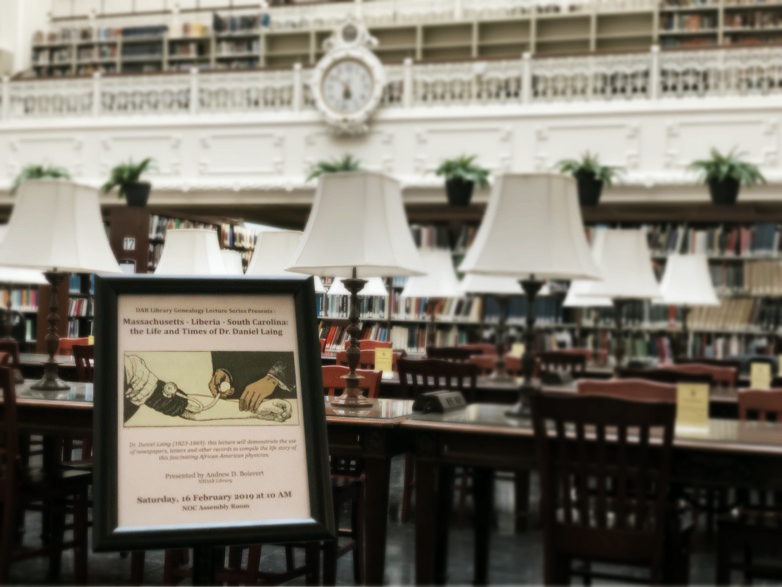 The DAR Library has been busy planning the 2019 Library Lecture season. We will start the lectures off with a bang on February 16, when Andrew Boisvert will discuss the extraordinary life of one of the first African-American physicians in the United States, Dr. Daniel Laing, in a lecture titled “Massachusetts – Liberia – South Carolina – the Life and Times of Dr. Daniel Laing.” Dr. Laing was born in Boston, Massachusetts, in 1823. He attended Harvard Medical School, before it expelled him, due to protests by his fellow medical students, who objected to an African-American classmate. He then studied medicine in Paris and completed his education at Dartmouth Medical School, graduating in the class of 1854. Dr. Laing then moved to Liberia, where he practiced medicine. Upon his return to the United States, he settled in South Carolina, where he died in 1869. His extraordinary life allows us to discuss different genealogical and historical sources for the time period, as we examine his life, and the lives of the people around him. This year we are starting a new lecture series called “Research Around the States.” These lectures focus on the history, repositories, and research strategies specific to the states in question. The lectures will start off with Connecticut on March 12, followed by Delaware on April 13, and Pennsylvania on May 18. The Fall portion of this series will cover New York on September 10, Rhode Island on November 9, and New Jersey on December 3. Other states will be covered in future years. Another new Library lecture series for this year will be aimed at novice researchers and titled “Exploring Your Roots.” The first installment of that series will be on August 3, when we will discuss organizing your records and getting started. The second lecture in the series will look at census records, discussing why to use them, where to find them, and how to get the most out of them. And as always – if you cannot join us in Washington DC for the lectures themselves, you can always take advantage of the recordings posted later at the Library website at www.dar.org/OnlineLectures, which already includes such recent lectures as the fascinating discussion of naming patterns from December 2018, Colonial New England resources, and Revolutionary military records, along with many others. #TBT 125 years ago, on April 19, 1894, the Sequoia Chapter in San Francisco, California, planted a �... 18 hours 3 min ago.